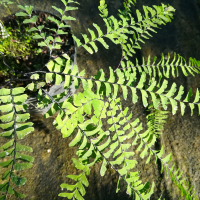 A real delicacy amongst ferns, Adiantum pedatum produces conspicuous black wire like stems bearing beautiful maidenhair-fern like fronds of a most pleasing green. 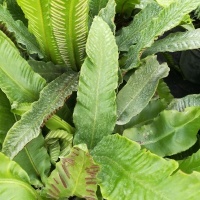 An uncommon fern in cultivation, so named the 'Up-side down fern because the yellow green fronds do look the wrong way round. Also called Phyllitis scolopendrium or The Harts Tongue Fern, lovely evergreen fronds of rich mid-green always look neat and tidy. It is easy to grow and contrasts so well with daintier foliaged subjects. 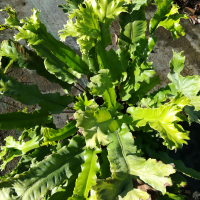 An unusual form with the leaves that are crested at the tips. 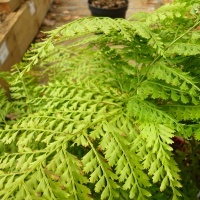 A relatively easy fern to grow.